Talking about fears and getting to know them is a good thing but do you know that apart from the fears that are well known to the world, Indore’s population have their own Indori Syndromes and they are so scared of them that they go wild if they get an ‘Attack’. Be aware! There might be a patient near you! Sounds confusing? Well, have a look! This Indori Syndrome is caused when an Indori has no Sev around him and the lack of it causes him dizziness and sinking sensation.This sudden shock of reality can make an Indori go into a complete shock and the only way to recover him is a fistful of Sev in his mouth. No-Sevophobia is the most common fear amongst Indori population and you will find seldom people go into this phobia as Bhiya idhar to hamesha bora bhar ke Sev milti hai gharo me! Sarafa Stroke is a severe a pain in the chest, due to the fact that a person hasn’t been to Sarafa for more than a week and you must take him to the Sarafa immediately. Waha jaake agle ka man machal jaega aur dard hawa ho jaega jaise hi wo Bhutte ka Kees, Joshi ka Dahi bada, Jaleba, Shikanji, Garadu aur ye sab delicacies that Sarafa is famous for dekhega! Once an Indori is going to have all of that, he will be healthy as a horse! Sevophilia is a disorder of function that affects the entire day of an Indori. Indori people want Sev in everything. So be it Samosa, Pohe, Lunch, Breakfast, Dinner and pretty much everything. Like the way people breathe, an Indori Eats Sev. Heck, you will find Indori people having lunch or a dinner of complete Sev if they don’t have an option to properly eat anything or they are on the go! Plate bhar Sev khao aur kaam ho jaata hai lapak ke! Jeeravanzea is a rare Indori Syndrome where the person gets a severe itching in the mouth when he doesn’t get a taste of Jeerawan in anything that he is eating. Rest of India sprinkles salt over food or anything that they are about to eat and Indori people Sprinkle Jeerawan over it. Jeerawan is that magic powder that has a tendency to make anything automatically lip-smacking tasty! If you haven’t tasted Jeeranwan yet, then you have no right to live in Indore! Dafa ho jao yaha se! HAOPhilia is a speech problem where a person has to add an ‘Hao’ to anything that is been spoken or else it results in improper talks. Mausi key yaha ho aaya? – HAO! Kaam kar liya? – HAO! Padhai ki re tune? – HAO! Khaana laga du? – HAO! Bhiya, waha chaloge? – HAO! Arrey nal aa gaya paani bhar le! – HAO! Dekha? How one word is the answer to everything here! That’s the magic, that’s the immense power of the word HAO! Chappanoid is a typical Indori Syndrome where a person gets severe cramps in legs and stomach if he is not been to Chappan Dukaan for more than 3 days. The tempting and irresistible feeling you get when you are near Chappan ko hi Shashtro me Chappanoid bataya gaya hai. No matter in which part of Indore you live, you need to visit chappan at least once a month or else you will end up getting this syndrome so bad that you may have to run to the place there itself to save yourself! Pohacravia is a craving that results due to lack of Poha. The only way to cure a person having this condition is to serve him a plate of Poha immediately. You gotta have a plateful of Poha every morning or else you will suffer from Pohacravia. So, make sure that you are eating poha everyday to keep this craving away! 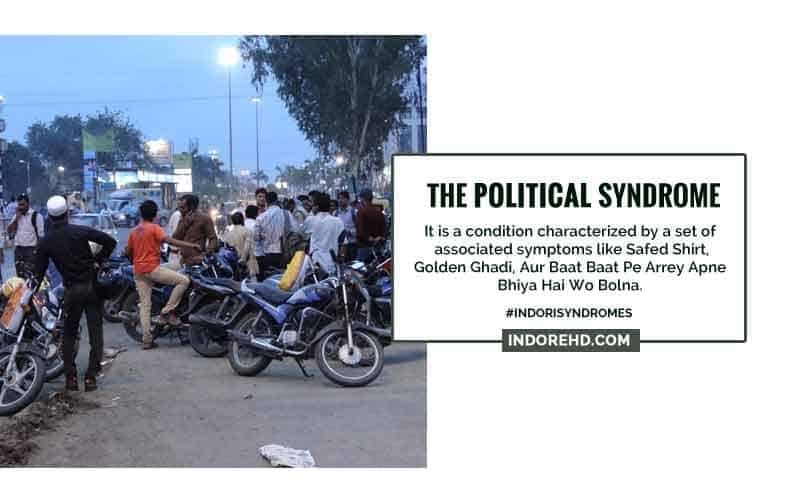 The Political Syndrome is a condition characterized by a set of associated symptoms like Safed Shirt, Golden Ghadi, Aur Baat Baat Pe Arrey Apne Bhiya Hai Wo Bolna. Here, everyone is ‘connected’ to some or the other person who is ‘connected’ to some or the other person and the chain forms a link to someone who might be sitting in Delhi! Most of the Indoris are born Netas boss! So, here is a list of 8 common Indori Syndromes that every second Indori suffers from. Be cautious and spread awareness, there might be a patient near you! Take precautions and make sure that all your friends and family are safe! Rahul Solanki – An Indore Based Artist creating extraordinary artworks with fragments of paper! 10 money saving tips for Millenials that will let you have an actual Bank Balance! How to ace that perfect, confident look for your Interview! Sure shot ways + style tips inside.